TV show dates: July 15, 2016 — present. Performers include: Winona Ryder, David Harbour, Finn Wolfhard, Natalia Dyer, Charlie Heaton, Millie Bobby Brown, Caleb McLaughlin, Gaten Matarazzo, Cara Buono, Matthew Modine, Noah Schnapp, Joe Keery, Sadie Sink, Dacre Montgomery, Sean Astin, Paul Reiser, Linnea Berthelsen, Brett Gelman, and Will Chase. A period horror drama from the Duffer Brothers, the Stranger Things TV show kicks off on November 6, 1983 in rural Hawkins, Indiana. The story centers on the disappearance of 12-year-old Will Byers (Schnapp) after a night of playing Dungeons and Dragons with his friends Mike Wheeler (Wolfhard), Dustin Henderson (Matarazzo), and Lucas Sinclair (McLaughlin). When Mike’s mother, Karen (Buono) ends their game, Will and Dustin hop on their bikes and start to race home. Not long after Will pulls ahead, he crashes and ends up running home, while something chases him. When no one but the dog is home, he retreats to the shed, where he loads a gun. As the lights flicker, something growls, and Will vanishes. After a series of power outages in the area, morning finally breaks, and Will’s mother, Joyce (Ryder), and brother, Jonathan (Heaton), realize he is missing. As Will’s family, friends, and the local police search for clues to his disappearance, they find themselves entwined in an incredible mystery involving both the supernatural and the top secret experiments at the Hawkins National Laboratory, which is clearly not what it seems. Does the unusual semi-verbal young girl, who identifies herself as Eleven (Brown), hold the keys to unlocking the secrets of Will’s fate? Stay tuned. What do you think? Do you like the Stranger Things TV series? Should this TV show be cancelled or renewed for another season on Netflix? 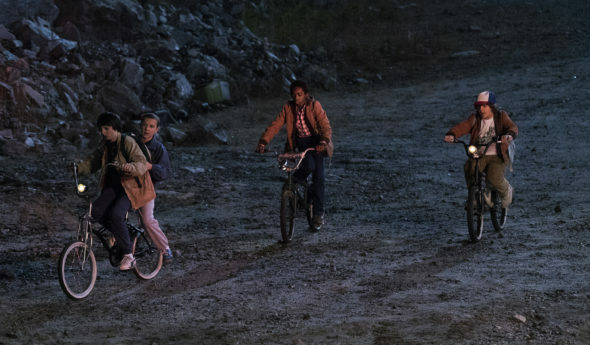 Stranger Things: Season Two and Beyond; How Long Could the Netflix Series Run? Renew it, please. One of the best shows around.